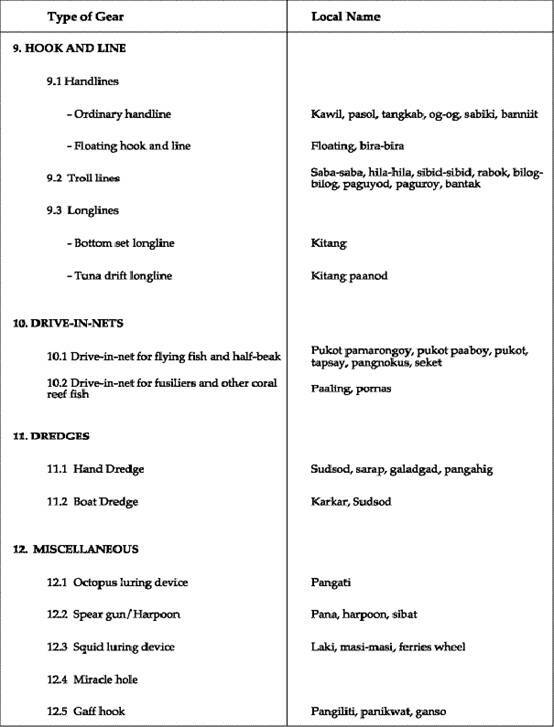 This revised volume is a combination report of the survey on Marine Fishing Gear and Methods, conducted in the Philippines between August 1988 and September 1989 and the additional surveys conducted in another six (6) regions from 1996-2001. The survey was conducted using the same methods as in the first and second volume (Thailand and Malaysia). In this volume, 756 designs of fishing gear and methods were dissected and were the basis for the choices of selected drawings in the revised monograph. The data, which was collected by the same method as in the former volumes, is shown in Table 12. Background information on the current status of different fisheries was based on data contained in the annual “Fishery Statistical Bulletin for the South China Sea Area of 1997” and the National Fisheries Statistics of the Philippines, 1991-2000. 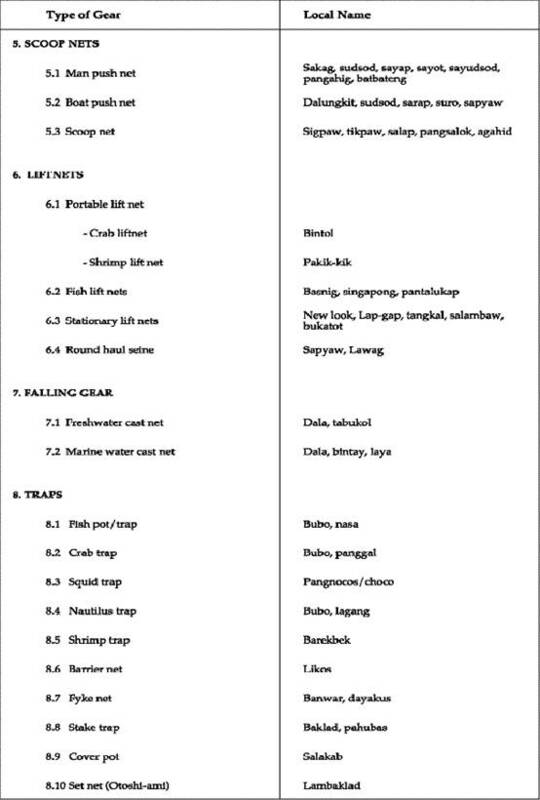 In this revised volume, the classification of fishing gear is presented with a description of each group. This is based on the system adopted in the “Definition and Classification of Fishing Gear Categories” by C. Nedelec, FAO Fisheries, Technical Paper 222. The mode of presentation is summarized below. 1) The horizontal lengths of surrounding nets, purse seines and gill nets are drawn according to the length of the floatline, and the vertical depth according to the fully stretched netting. In the case of gill nets with side lines, the depth is drawn according to their length. Some types of gear are shown by schematic or partly perspective overall sketches, with dimensions indicated where applicable. 2) General outline drawings, such as of the rig of a complete gear, and detailed drawings of components, are mostly not to scale, but the main dimensions are given. 4) Mass and weight are indicated in the units of kilogram (kg) and gram (g). Buoyancies of floats and breaking load of netting yarns or ropes are shown by kilogram-force (kgf) or gram-force (gf). 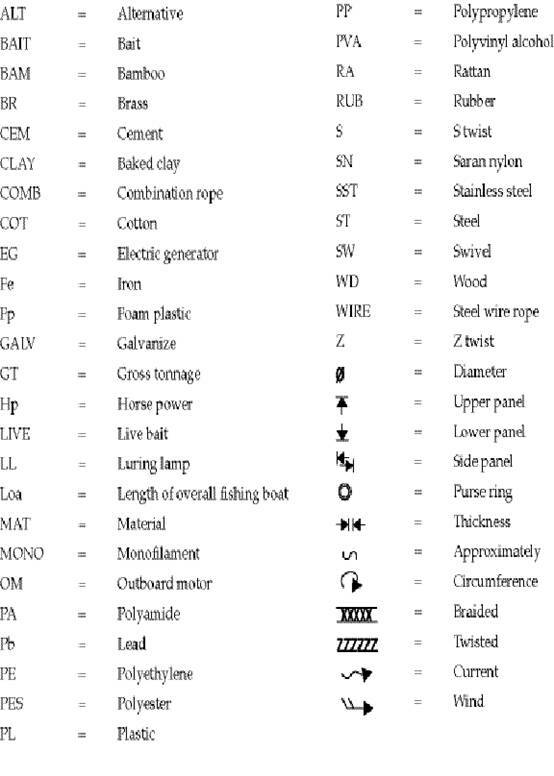 5) Materials are indicated by the abbreviations listed in Appendix 1. 7) The mesh size, given in millimetres (mm) is understood to be the distance between the centres of the two opposite knots in the same mesh when fully stretched. 8) The number of meshes in a straight row along the edge indicate the width and length or depth of net panels or sections. 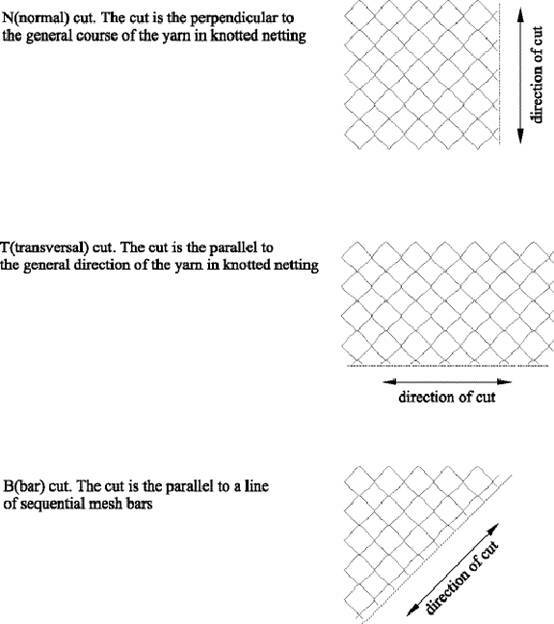 9) The shape of a netting section is indicated by the cutting rate at its edge. 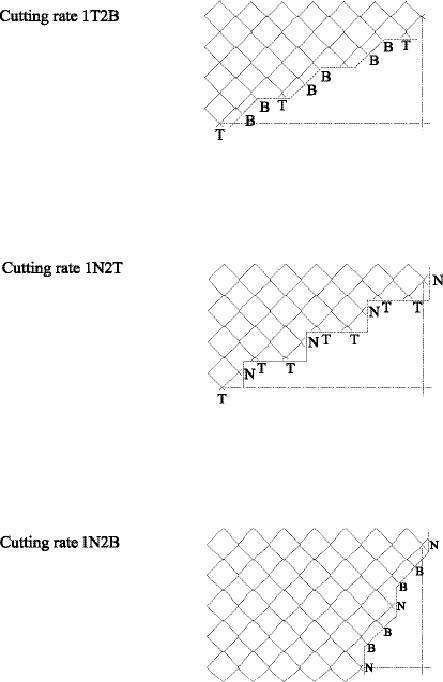 A tabulation of common cutting rates for practical ranges of taper ratios is given in Appendix 2, together with a diagram of different cutting rates. 10) The term hanging ratio (E) designates the ratio between the length of a given portion of the mounting rope and the length of the stretched netting hung on this portion of the rope. ABBREVIATIONS AND SYMBOLS USED IN ILLUSTRATIONS. variants refer to only one component part of the gear, other possible ways of making this part are shown with the abbreviation ALT. 12) The sequence in fishing operation is shown by sketches with circled Arabic numerals (1, 2 …) which indicate the sequence of operational stages. A net roughly rectangular in shape without a distinct bag is set vertically in the water to surround the school of fish, generally of pelagic nature. The nets are subdivided into three major types: One boat purse seine; Two boat purse seine; and Surrounding net without a purse line. The ring net type is included in this category. A bag shaped net with two wings, normally, the wings are larger than those of trawl nets. The net is pulled towards a stationary boat or onto a beach. A seine net of a primitive nature sometimes does not have a bag. Insofar as the net is pulled towards a stationary boat or beach, it is included herein. A conical bag shaped-net with two or more wings, pulled by one to two boats for a period of time, to catch mainly fish or other aquatic animals that live directly on, or stay near the sea bed. When such a gear is used in mid-water with the same catching mechanism, the mid-water trawl is included herein. The trawl is also divided into three major types : Otter trawl, Pair trawl, and Beam trawl. A net wall, with its lower end weighted by sinkers (or heavy net, as in drift gill net) and the upper end raised by floats, is set across the path of migrating fish. Fish trying to make their way through the net wall are gilled or entangled in the mesh. The trammel net with two to three wall nets is also included herein. The migrating fish are entangled between two layers of net and not in the mesh where a combination of different types of nets are used. 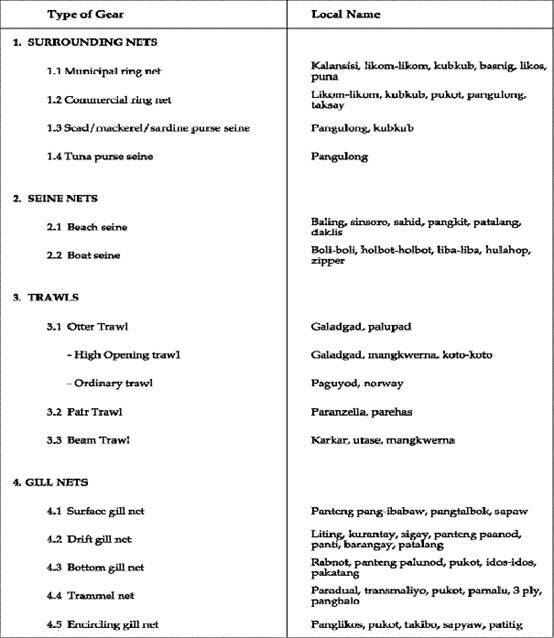 A bag net with a fixed or variable opening is operated in shallow waters or from boats. Some large scale scoop nets are operated from a motorized boat such as the boat push net. A sheet of net, usually square, but may sometimes be conical, is stretched by several rods, ropes, or a frame and is set either at the bottom or in mid-water for some time and then lifted to trap the fish swimming above it. The gear is usually a cone shaped net or other material which is dropped or cast to cover aquatic animals and impound them. Generally hand-operated in shallow waters, some cast nets are operated from a boat or raft. Gear that is set or stationed in the water for a certain period, regardless of the kind of material used for their construction. The fish when caught are naturally confined in a collecting unit from which escape is prevented by labyrinths and/or retarding devices such as gorges, funnels, etc. without any active fishing operation taking place. This gear generally consists of line(s) and hook(s) where natural or artificial baits are hooked to attract fish or other aquatic animals. Unbaited hooks or a jig may also be used. A bag net with two wings, scoop net and wall with a coconut leaf fence are usually set in the water against the current. To a larger-scale drive-in net, one to two hundred fishermen with their frightening ropes and plastic hoses which emit bubbles drive the fish to enter the bag net and/or scoop net. A lift net is used to catch fish which are circling the net wall. An iron or net basket with a hard rectangular frame at the opening. This gear is dragged or pushed along the sea bed usually to collect molluscs such as mussels, oysters, scallops, clams, etc. The shellfish are held in an attached bag or sieve which allows the water, sand or mud to pass through. This group covers a great variety of other fishing gear and methods not specified elsewhere or that are based on mixed principles. For example hand hooks, harpoons or spears, gaff, etc.